Maria Hines vs. Morimoto: Oh my cod, she won it! If you missed watching James Beard Award-winning Seattle chef Maria Hines of Tilth take on Iron Chef Morimoto last night — and trounce him — too bad! It was a great battle. Maria grabbed a couple of incredibly ugly Pacific cod, and with the help of her talented taskmen Larkin Young and Jason Brzozowy, turned the fat-lipped fish into a thing of beauty in five exquisite courses. 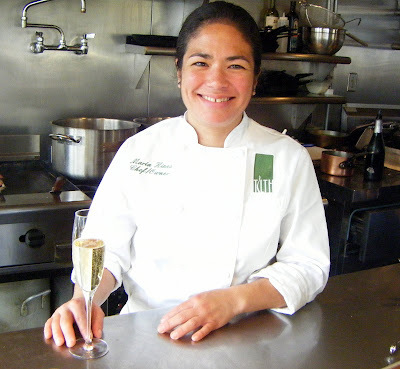 But we’re talking Food Network here, so you can tune in again for re-runs August 5 at 9 p.m., August 6 at midnight and August 7 at 5 p.m.
Maria Hines, owner/chef at Tilth in Wallingford, deserves a glass of Champagne.